You are currently browsing the category archive for the ‘Uluru’ category. Even with the ash clouds surrounding the monolith and the smoke from brushfires, it is hard not to be impressed by Ayer’s Rock, also known as Uluru. It is like a windblown, ancient iceberg that has drifted to the centre of Australia, then settled into stone. It juts from the earth immense and alone, surrounded by unforgiving desert. The sandstone formation stands 348 m (1,142 ft) high with most of its bulk below the earth, awaiting a race of giants for excavation. Its girth is 9.4 km or 5.8 miles. 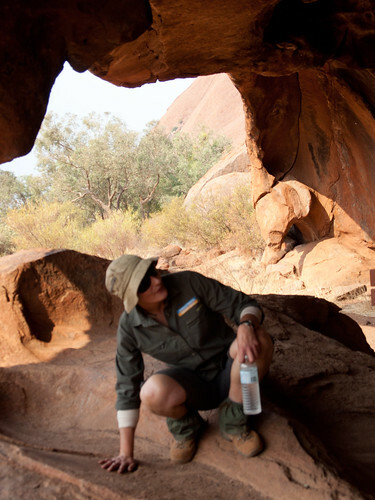 Our outfitter is WayOutback Adventures. Our guide/driver/cook/nurse/alarm clock/fire maker/ talking encyclopedia is a true-blue Aussie of Russian extraction, Tamara. We will all learn to appreciate her unflappable character over the next few days. 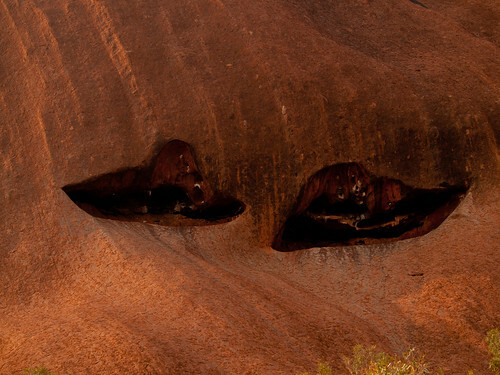 Uluru is an inselberg, literally an “island mountain”. Inselberga are prominent, isolated knobs or hills that rise abruptly from relatively flat erosion lowlands in a hot, dry region. 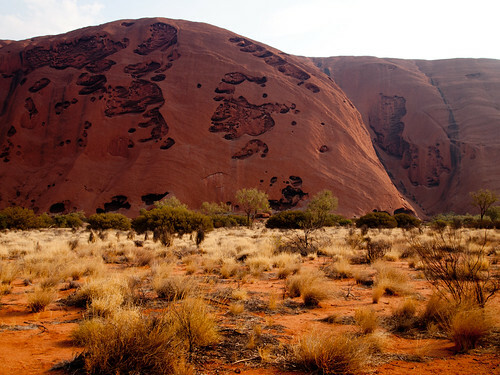 The remarkable feature of Uluru is its homogeneity and lack of jointing and parting at bedding surfaces, leading to the lack of of scree slopes and soil. 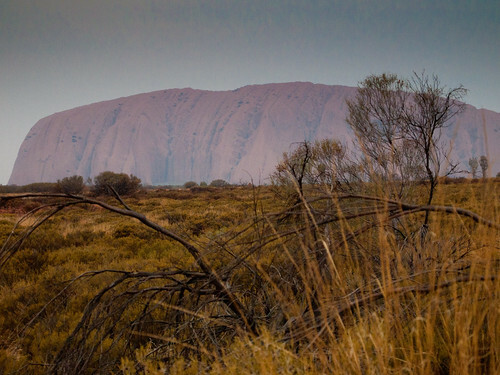 Thanks to these odd characteristics, Uluru still stands while the surrounding rocks have all eroded to nothing. Geologists refer to the rock strata making up Uluru as the Mutitjulu Arkose, and it is one of many sedimentary formations filling the Amadeus Basin.The layers of sand were nearly horizontal when deposited, but were tilted to their near vertical position during a later episode of mountain building, possibly the Alice Springs Orogeny of Palaeozoic age (400-300 Ma). Norbert Brockman’s (1997) Encyclopedia of Sacred Places tells of two tribes of ancestral spirits who were invited to a feast, but distracted by the beautiful Sleepy Lizard Women and did not show up. In response, the angry hosts sang evil into a mud sculpture that came to life as the dingo. There followed a great battle, which ended in the deaths of the leaders of both tribes. 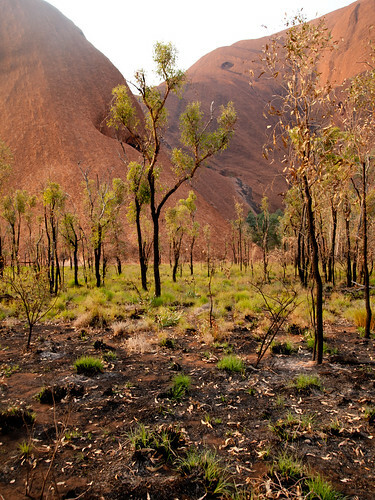 The earth itself rose up in grief at the bloodshed, becoming Uluru. Archaeological findings to the east and west indicate that humans settled in the area more than 10,000 years ago. Uluru and Kata Tjuta (also called the Olgas) were mapped by Europeans in 1872 during the expeditionary period and the construction of the Australian Overland Telegraph Line. In separate expeditions, Ernest Giles and William Gosse were the first European explorers to this area. While exploring in 1872, Giles sighted Kata Tjuta from a location near Kings Canyon and called it Mount Olga. The following year Gosse observed Uluru and named it Ayers Rock, in honour of the Chief Secretary of South Australia, Sir Henry Ayers. The first tourists arrived in the Uluru area in 1936. 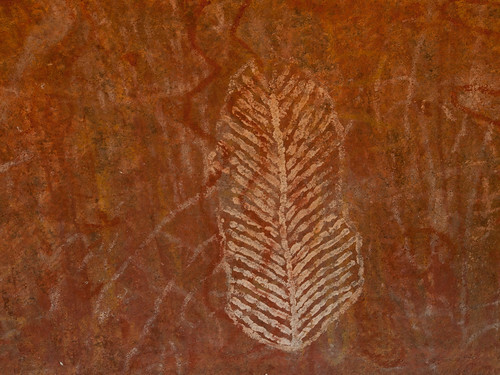 Beginning in the 1940s, permanent European settlement arrived in the area for reasons of the Aboriginal welfare policy and to help promote tourism of Uluru. The increased tourism prompted the formation of the first vehicular tracks in 1948 and tour bus services began early in the following decade. In 1958, the area that would become the Uluru – Kata Tjuta National Park, was excised from the Petermann Reserve; it was placed under the management of the Northern Territory Reserves Board and named the Ayers Rock – Mount Olga National Park. By 1959, the first motel leases had been granted and an airstrip was constructed close to the northern side of Uluru. Climbing Uluru is a popular attraction for visitors. A chain handhold was added in 1964 and extended in 1976. It makes the hour-long climb easier, but it is still a steep hike to the top, where it can be quite windy. Climbing is generally closed to the public when high winds are recorded at the top or when the temperature reaches 36 degrees celsius. There have been at least 35 deaths relating to recreational climbing since such incidents began being recorded. 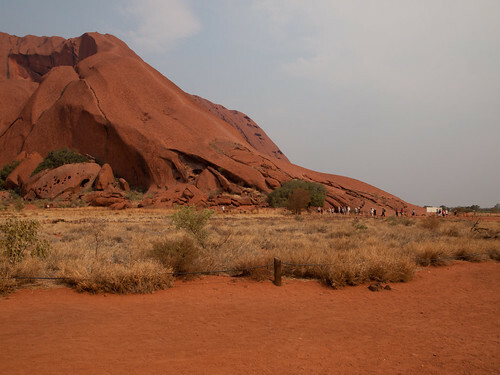 The local Aṉangu do not climb Uluru because of its great spiritual significance and they request that visitors refrain from climbing, partly due to the path crossing a sacred traditional Dreamtime track, and also due to a sense of responsibility for the safety of visitors. Our only decision was how much ground to cover in the midday sun. We are all travellers from far flung, Northern lands, ill adapted to this heat. We keep a wary eye out for snakes and listen to the wind. Tonight, we’ll rest up from our travels and try to get a good night’s sleep in our unaccustomed surroundings. The walk in Kata Tjuta is long and it will be just as hot tomorrow. We have to get an early start. Thanks to the first-rate Wikepedia contributors for much of the info in this post.